As expected, the Trump Administration is suing to block California’s newly enacted net neutrality bill SB 822 from coming into effect January 1, 2019. The bill is widely seen as the strongest and most comprehensive state-level response to the FCC’s resoundingly unpopular repeal of open Internet protections. While the lawsuit is coming from the Department of Justice, it’s clear that it has FCC Chairman Ajit Pai’s fingerprints all over it. 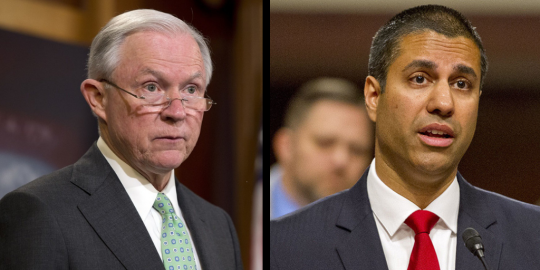 “Ajit Pai and Jeff Sessions want to attack net neutrality again? We say bring it on. We brought this bill back from the dead more than once and are ready to fight whatever comes next. It’s sad but unsurprising to see the government picking a fight on behalf of Comcast and Verizon, ignoring the overwhelming majority of voters from across the political spectrum. This bill passed the California legislature with overwhelming bipartisan support. By suing to strike it down, the Federal Government is actively undermining democracy. California has a strong case. The FCC can’t have it both ways. If they refuse to do their job providing basic oversight for big telecom companies, they can’t throw a fit when the states step in to do their job for them. In the end, all this lawsuit does is put more pressure on our elected officials in Congress to sign the discharge petition and support the CRA resolution to restore net neutrality across the US. The fact that the administration didn’t even wait until after the midterms to launch the suit puts vulnerable members in an even more precarious position. SB 822 will protect Internet users against blocking, throttling, harmful zero-rating, and paid “fast lanes” – exactly what telecom giants have worked so hard to kill federally. To get SB 822 passed, grassroots Internet users went up against one of the most well-resourced lobbies in the country and won. They hate this bill more than anything and are calling in every favor they can to stop it.